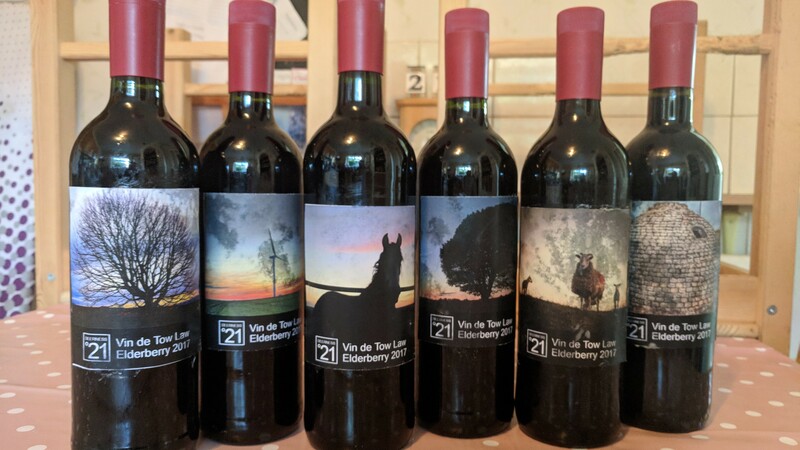 As it’s been a while since my last blog about my attempts to make wine I thought I’d do an update! 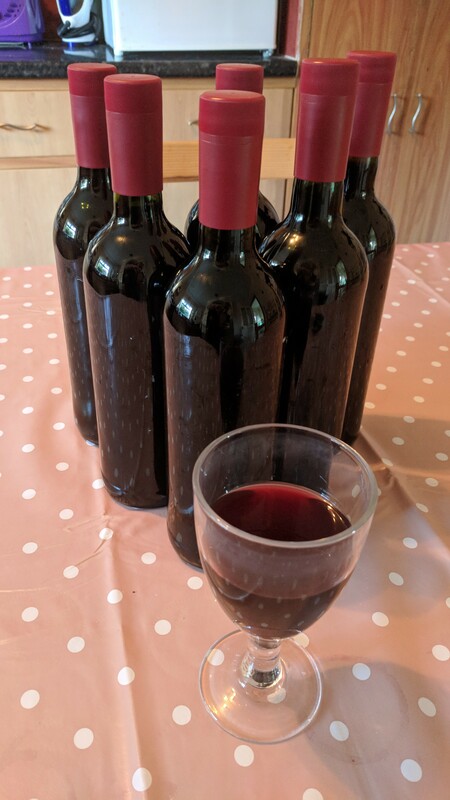 At the end of May I decided that I should bottle the Elderberry wine I started in October last year. I’d washed out the bottles and got the labels off them the day before so all I had to do was sterilise everything before I started. 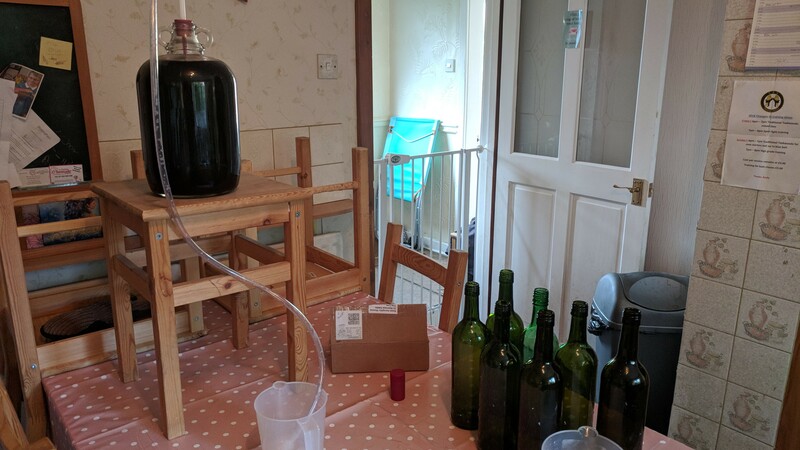 I set everything up on the kitchen table and despite initially struggling to get the wine to flow (the cork was too far into the demijohn – strange as it wasn’t an issue with an identical one yesterday!) 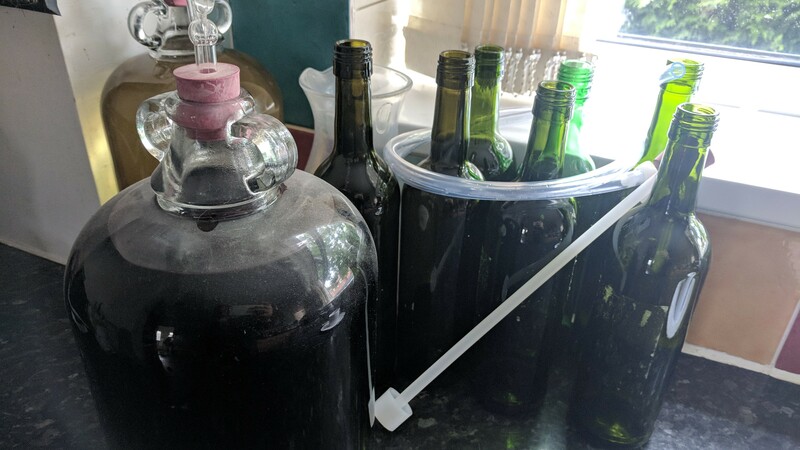 I filled five and a half bottles before the wine flow ground to a halt even though there was still quite a lot left in the demijohn. That’s the problem with the silt trap on the syphon tube – so I decided to remove it and fill the last bottle. It was a bit of a struggle to get it going again but I soon had the last bootle full. I put some more wine into the measuring jug and used that to top up the bottles. There was still enough to fill a wine glass for ahem…testing purposes! The bottle tops I had bought during the week were a doddle to use and pretty soon I had six sealed bottles of wine on the table! I had printed out some labels for the bottles. 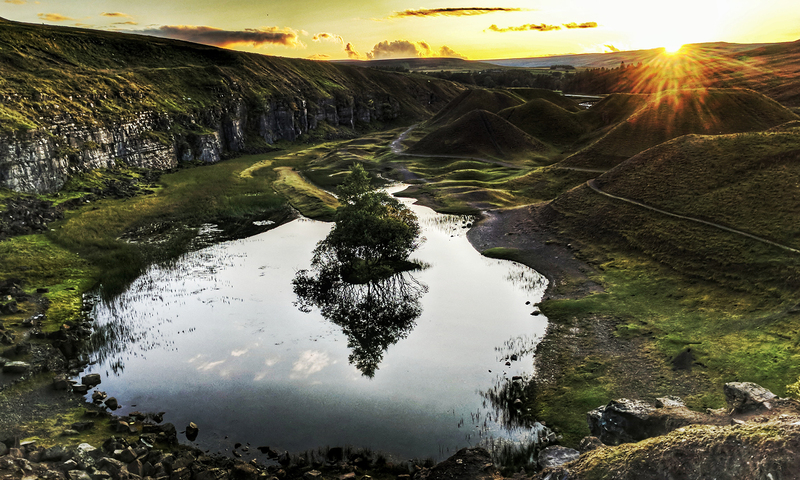 I’d designed them a few weeks back and used my photos of the surrounding area as the basis to create a number of individual labels. I went up into the attic and got my guillotine out to cut them out. Yesterday I had bought some spray glue from the pound shop so I used that to attach them! I used to used spray mount years ago and I was expecting this to be the same but it wasn’t and the glue came out somewhat manically and in lumps. I maanged to get all 6 labels on but some had more glue on them than I would have liked! 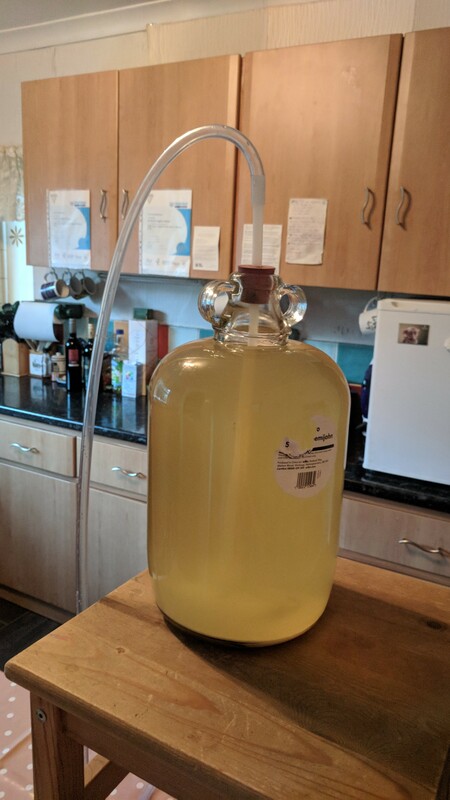 The mead that I started in February has been racked twice – I messed it up the first time disturbing the lees on the bottom of the demmijohn and sending clouds of them into the almost clear liquid meaning that by the time it was in the new demijohn it was all cloudy again! I then had to wait until it settled so I could do it again! IT’s currently sitting nice and clear waiting to be bottled some tine around September. I did think about making dandelion wine this year but if I’m honest by the time the dandelions had come out I was so busy with work and other things I never found the time to go and pick any – oh well maybe next year! Feeeling cheated by this I decided to try something else and that turned out to be Elderflower champagne! I’d seen a recipe for it on line and it sounded quite quick and easy so I thought why not! 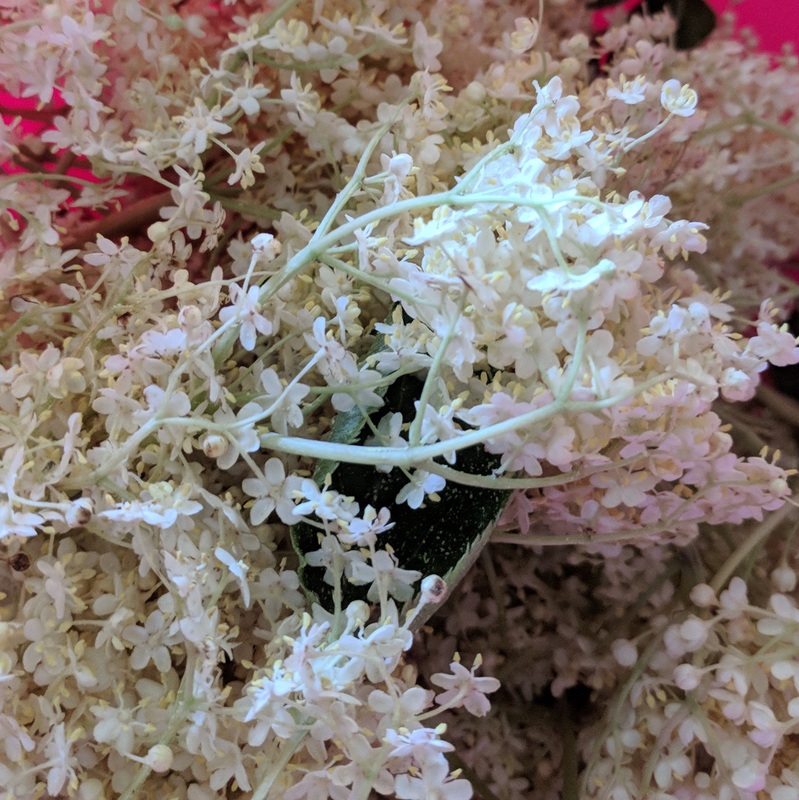 I’d been working from home and at lunchtime I took dog dog out for a quick walk and we head down onto Millennium Green where I had spotted some Elderberry trees on my walk the other night. Unluckily for me they were more difficult to get to than I had expected and I had to fight through nettles to get to them! Luckily I only got stung once and I soon had a bag of elderflowers to take home. 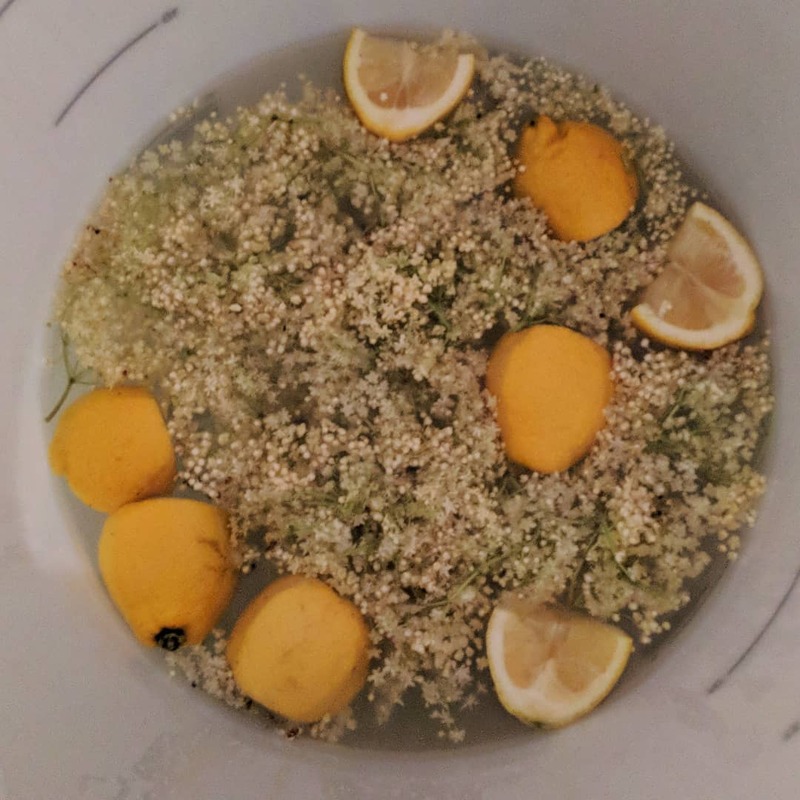 Then in the evening I set about making my Elderflower champagne. I’d boiled some water earlier and added the sugar till it dissolved and then added cold water and left it to cool down. Now I had to add the elderflowers and the other ingredients like lemons and yeast nutrient to the mix! I didn’t add any yeast because it said to wait a few days to see if the natural yeasts in the flowers started the process off! A few days later there was no sign of activity so I decided I would add some yeast. The original recipe called for champagne yeast but I knew I’d have to order that. Others said any yeast would do so I decided to head up to Wilko at lunchtime to buy some just in case. It was a lovely day so I decided to walk through the park to get there but when I did they didn’t have any! Still it got me out of the office! I had some yeast that came with the original kit that Sarah bought me that never got used so I used that when I got home and discovered that there was still no action! Almost as soon as I added it I could tell it was going to be ok and by the time I went to bed there definitely seemed to be something going on! 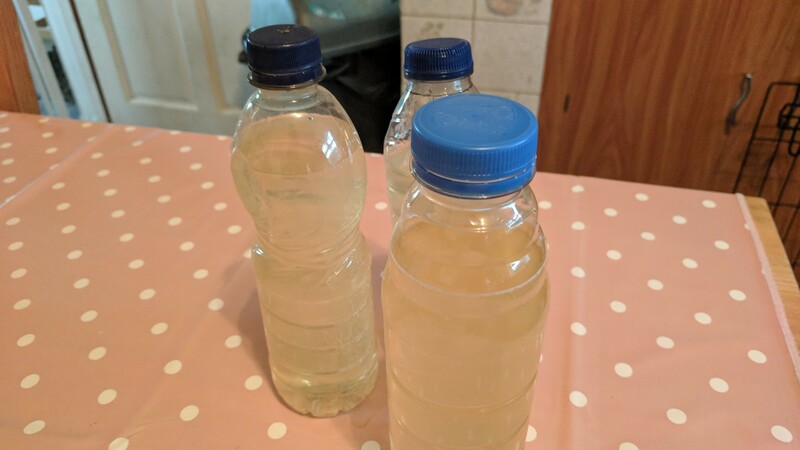 After a week the idea is that you put the resulting liquid into bottles but most sites suggest that you monitor the bottles everyday and “burp” then to prevent a build up of gas which can in extreme cases shatter the bottles! However I didn’t have any bottles yet and I was unexpectedly going away with work the following week so to be safe I decided to put it into a demijohn till I got back. So on Sunday evening I set about transferring the elderflower wine out of the fermentation bucket. 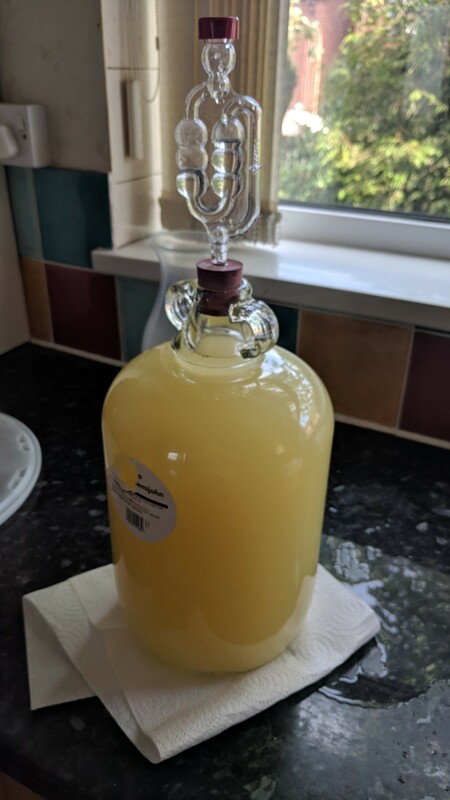 I fished out all of the lemons and elderflowers before filtering the liquid through a muslin cloth and funnel into the demijohn.The resulting liquid in the demijohn looked very cloudy so I might have to look into what went wrong there! It says leave for a few hours to settle but this looks like it could take a lot longer! So the following Sunday I went to transfer the elderflower champagne into the bottles I bought that afternoon at Wilko. While I enjoy wine making I find the sterilisation of everything to be such a pain! Still I was soon all set up and ready to go! I had hoped to buy 75cl bottles but they seem to have to be ordered in! I had thought to order some to be picked up in Sunderland on Saturday but it took four days and I didn’t remember to do it till Thursday! In the end it was just as well as we didn’t make it to Wilko in Sunderland that day! So I settled for 50cl bottle but the advantage of that is that they will come in useful for cider which I have promised to make at some point soon! However it did mean that I still had some left over after filling the bottles so I put it in plastic bottle. One of the pages I read recommended using plastic in case the gas put the bottle under pressure. I don’t think mine is fizzy enough for that but I figured the plastic would alert me to any issues with the glass before it became an issue – if you see what I mean! 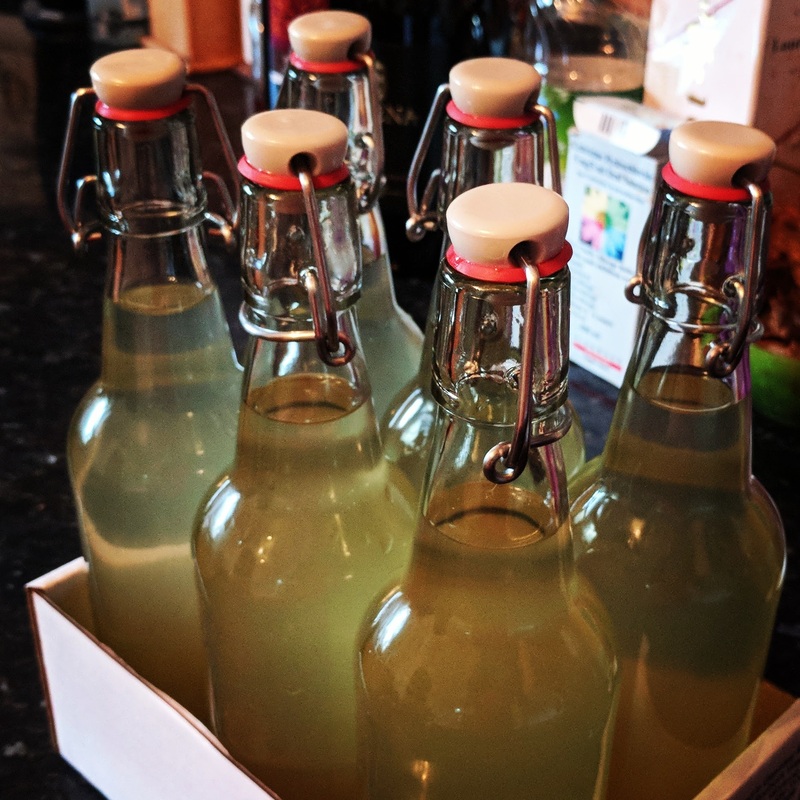 I left the bottles for a few days and then I tried my elderflower champagne! I’d put a bottle in the fridge before I left for work so it would be nicely chilled by the time I got back. We had lasagne for dinner so it went nicely with that. The verdict so far – it tastes quite nice but isn’t very fizzy. I did add some sugar as per the instructions on another website I looked at but it didn’t seem to do much. I’ll add some to the other ones and leave a bit longer and see if that makes a difference. It is certainly alcoholic because I drank about 400ml and felt quite squiffy by the time I took dog dog out! 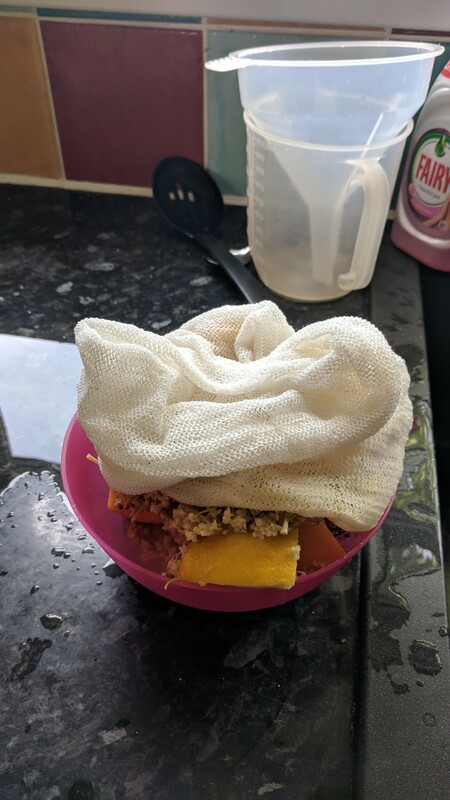 So that’s what’s been happening – I will try and make some cider at some point but I need to order some cider yeast first. Other than that it will be bottling the mead next so that I have room to start this years batch of Elderberry when the berries are ripe! Oh and there’s always the drinking to look forward to!